My visit to Kichi Kichi Omurice was pretty accidental. I usually try to plan my meals such that I get to eat a variety of food on a trip. For this one, I had in mind a few must-eat places and was trying to fill the gap of the remaining slots when I thought of eating Omurice (omelette made with fried rice) in Japan. There used to be quite a number of eateries serving omurice in Singapore a couple of years ago but has since dwindled to only a handful. I even decided to cook it myself at home in order to curb my craving for the fluffy and semi-flowy omelette. When I searched for omurice in Kyoto, Kichi Kichi was the restaurant that popped up. It was only then that I realised that this place was said to serve “the most awesome omurice in Kyoto”. Apparently the Chef had a famous Youtube video showing his signature presentation style, which I shall keep it as a secret for now. Reservations at this restaurant is accepted via an online website, which was a surprise (since most of the Jap establishments don’t provide online reservations). The place is small and intimate as they only seat 8 people per session and each session is for 1 hour seating. If I recall correctly, the evening slot has a total of about 4 sessions from 5pm to last seating at 8pm. When we arrived shortly before 8pm, there were a few other folks waiting outside. A staff came out to confirm our names for the reservation and proceeded to take our orders. Menu was printed on a single page with 10 items on the list including salad, soup, mains of chicken/beef stew and the star item – Omurice (available in full or half size). Once we enter place, you would see the open kitchen with 8 bar seats and a large table (which could seat about 4-6 pax?) tucked at the back of the eatery. 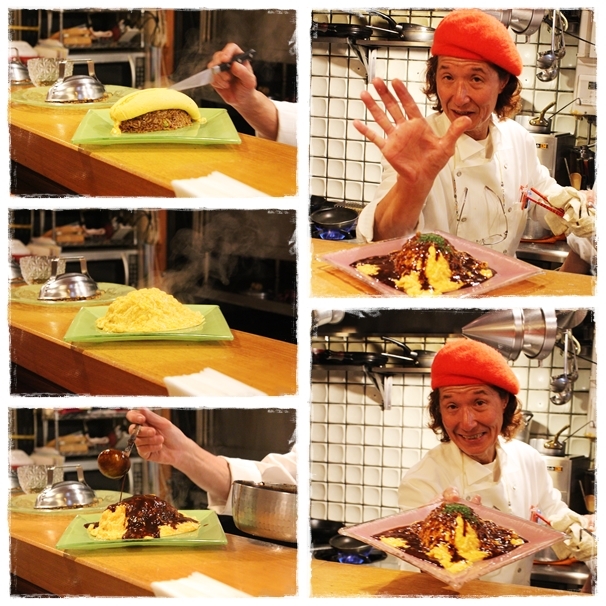 Obviously most diners would want a counter seat where we could witness the Chef himself preparing our Omurice. In fact we were treated to the magical moment where he performed his trademark Omurice presentation more than once when he served other diners next to us. Knowing that guests are here to watch him perform, there was a certain level of showmanship and animated gestures while he went about preparing the fried rice up till plating of the omelette. From adding the oil to the wok, to naming the ingredients that goes into the fried rice as he adds them into the heated wok to the tossing of the fried rice and plating the rice into a mould to get the perfect shape. Guests certainly have our eyes set on him. After he finished preparing the fried rice which is used as the base, Chef then went on to prepare individual portion of the omelette. We saw how he delicately used his wrist strength to flick the pan such that the semi-flowy omelette wraps itself up into a perfect roll before placing it on the fried rice. Anticipation rises the moment he flashed his sharp knife. He ensures that guests have their cameras or video recording ready before he makes a slit on the omelette which then blanket itself perfectly over the mount of fried rice. Check out my instagram for the video #yummydelightsg_kichikichiomurice. Chef then added the finishing touch by pouring the demi-glace sauce and sprinkled some chopped parsley. He even presents the dish to each guest and ends with a pose for us to snap some photos. 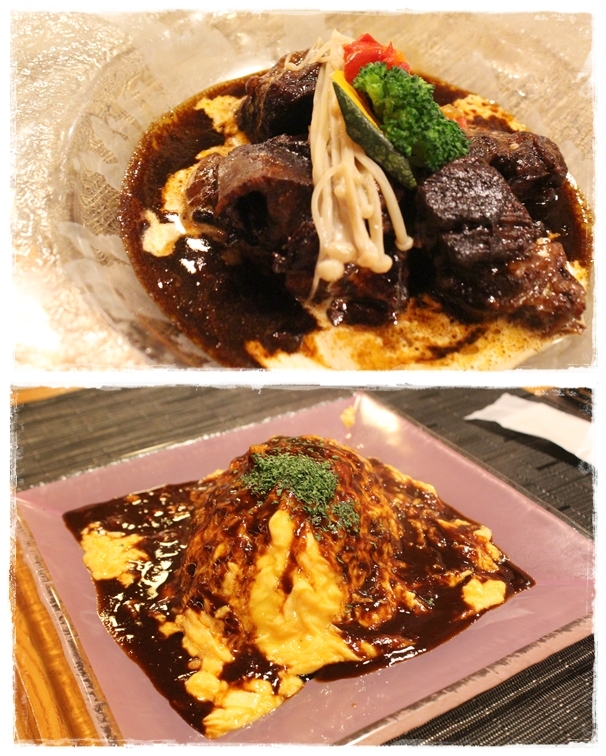 Other than the Omurice, we also tried the Beef Stew. The beef was soft and the stew gravy was rich and tasty. While I wouldn’t recommend choosing this over the fried rice, I think having this as an additional dish certainly add some “meat” to the meal. Personally I felt that the ingredients in the fried rice was not too substantial. 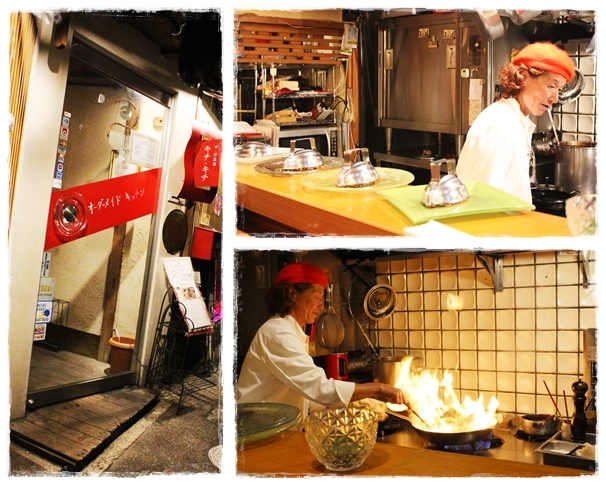 It was an unique dining experience in Kyoto to try Jap-style Western meal in a cosy and welcoming environment. My respect to the Chef for having to repeat this dish so many times a day and has been doing so for many years! It’s a one-of-a-kind Omurice which is hard for me to forget. The next day, while we were strolling along Shijo Dori we saw this shop space filled with gashapons (capsule toy vending machines). I saw a particular series featuring Jap food and I tried my luck hoping to get the Omelette Rice. Odds was 1 out of 6 and my wish came true! A nice souvenir to remember the unique dining experience at Kichi-Kichi. After our lunch in Arashiyama we took time to explore the mountainous areas (which is a lot less touristy as its further away from the shopping street). It involves a short hike up to a viewpoint with not many people to jostle with for this expansive picturesque view. 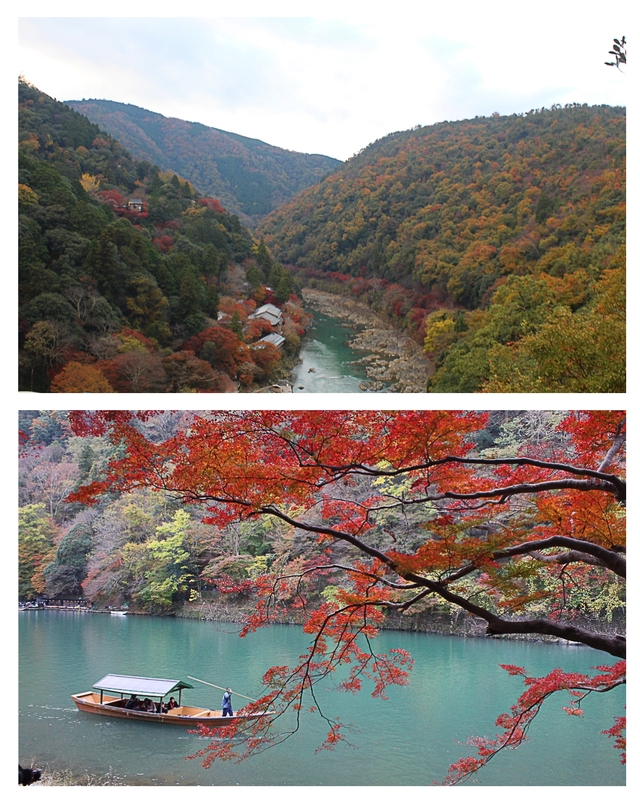 Along the river, you’ll see many visitors hired a boat ride to take in the foliage views on both sides of the riverbanks. We stopped by the Togetsu bridge area and wanted to grab a %Arabica coffee but gave up upon seeing the long queue. It was even longer than our wait during Sakura season. 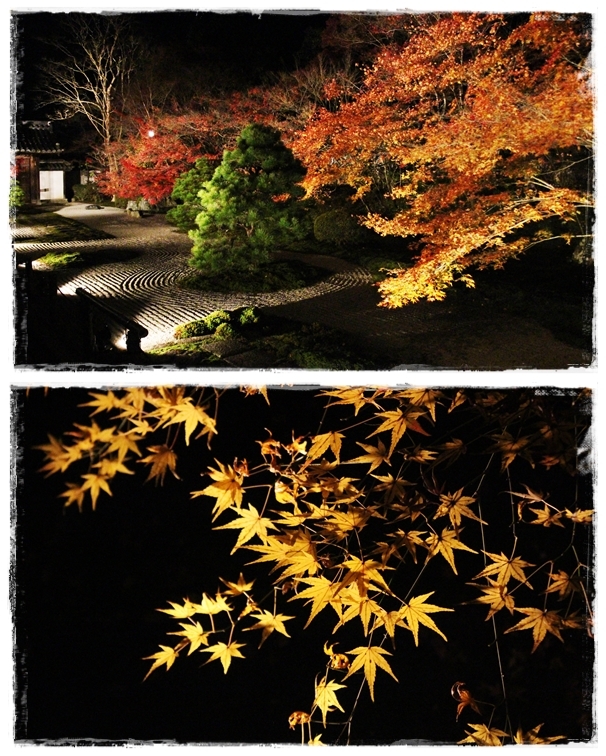 Time is precious as we were keen to make our way to Nanzenjifor our first Autumn Night Illumination viewing. One of the temple compound Tenjuan opens at 6pm and we were surprised to see a long queue even before they open their doors! Fortunately the queue moved quickly once they start letting guests in and we got into the compound after a 20 mins wait in the line. Being a noob I initially imagined that we would be let into a huge garden for a walk. Turned out that we had to take off our shoes, enter a wooden building, walked on the tatami/wooden plank floor before we arrive at a room whereby we saw this amazing sight! 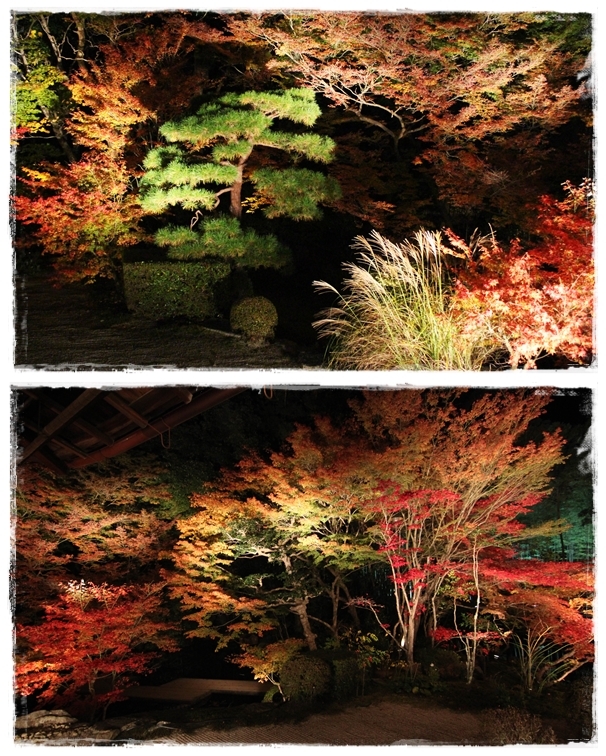 The red Autumn leaves looked fiery under the illumination and complemented by the rock garden landscape, this view was magnificent. After being awestruck by the sight, we then proceeded to another part of the building and saw another garden. This time round, the area where we stood to admire the view was a patio. 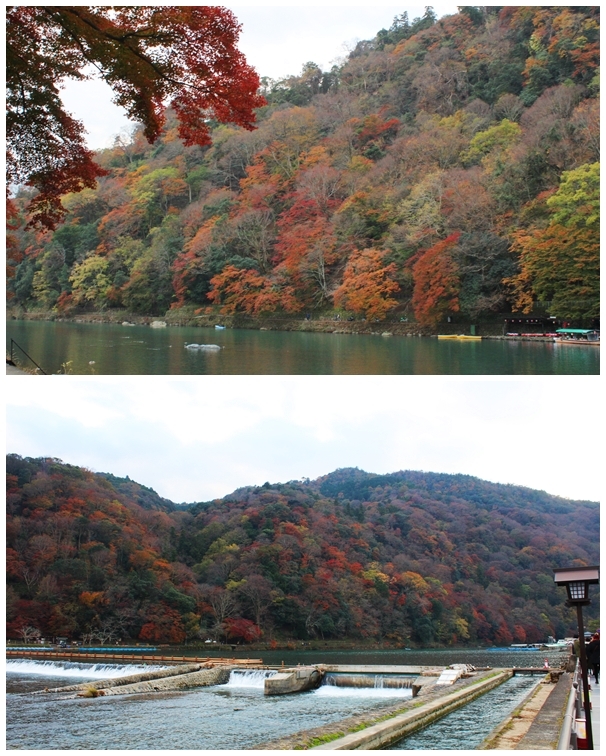 It was a mesmerising experience to see Autumn foliage at night and I actually prefer Autumn night illumination over Sakura night illumination. 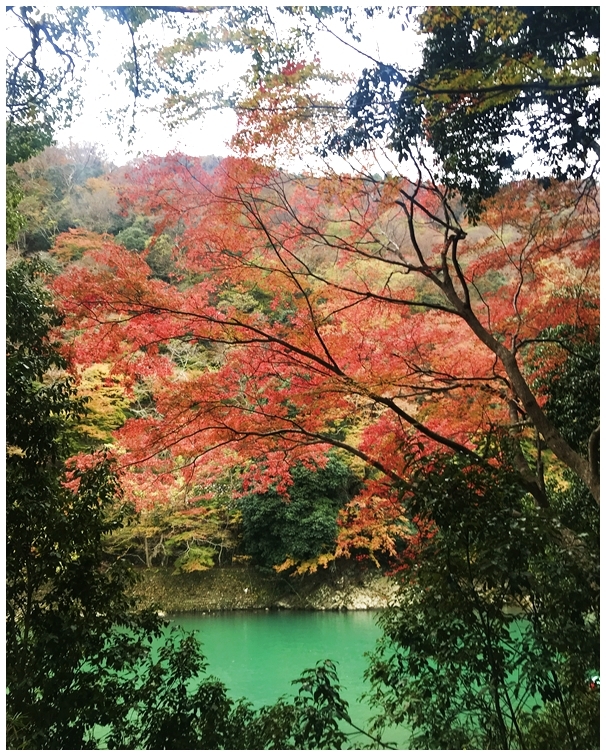 This entry was posted in Bistro & Cafe, Japan, Japanese, Western and tagged Arashiyama, Autumn, Autumn foliage, Japan, Kichi Kichi Omurice, Kyoto, Nanzenji, Night illumination, Omelette Rice, Omurice, Tenjuan. Bookmark the permalink. Like to know new updates?